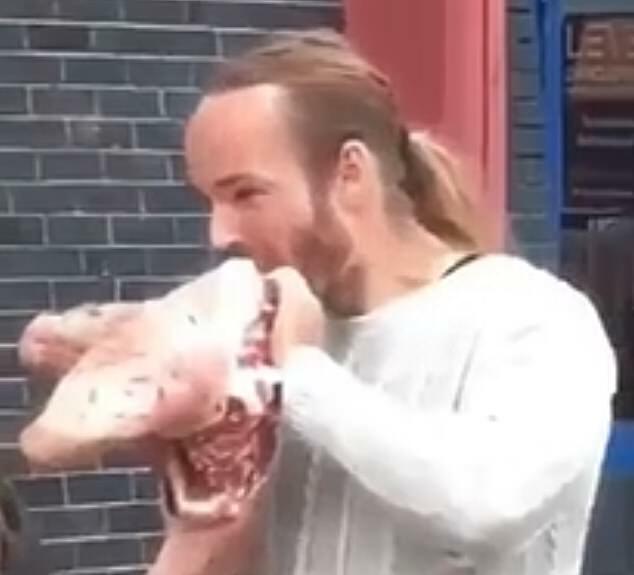 An ongoing conflict between disruptive vegan protest groups and anti-vegan counter-protesters reached a stomach-churning new low today as a man ate a raw pig's head outside a vegan food festival in Brighton. VegFest 2019 is in full swing in the Brighton Centre - a venue better known for hosting party conferences - but one bearded, ponytailed alleged carnivore stood outside to make his own statement. 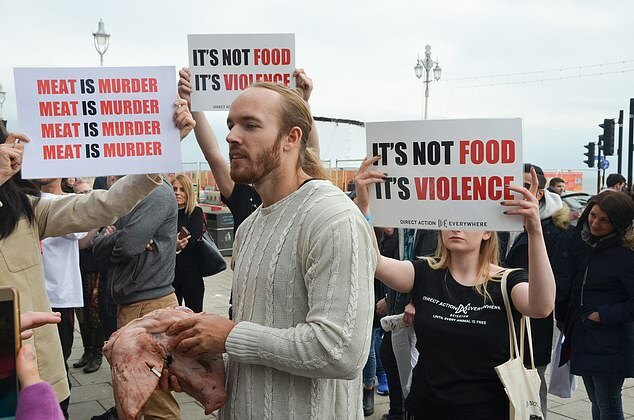 The 'protester' was confronted by members of the Brighton chapter of Direct Action Everywhere, an animal rights group, holding 'it's not food, it's violence and 'meat is murder' signs, the Brighton and Hove Independent reported. Pictures show the meat-eater bringing the raw pig's head directly to his mouth and tearing off flesh - with no apparent sign of enjoyment. The man and his affiliations have not yet been confirmed. Shortly after the pictures were disseminated, the vegan group issued a statement referring to how uncomfortable meat-eaters are made by 'seeing the faces of the animals they eat'. 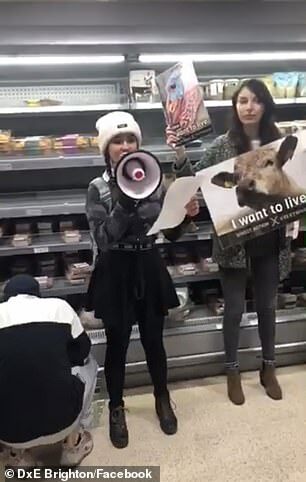 It follows several 'direct action' protests by the pro-vegan group in the city, including marching into a restaurant with 'meat is murder' signs, and blocking shoppers' access to food in a supermarket. Tim Barford, Vegfest UK manager, told the paper: 'We knew about the planned protest and were expecting 30 protestors. 'Three turned up, which was slightly sad for them and reminiscent of a Nigel Farage march. 'But they proceeded to upset kids and members of the public, and with that in mind, the police arrived, gave them a warning and sent them packing. 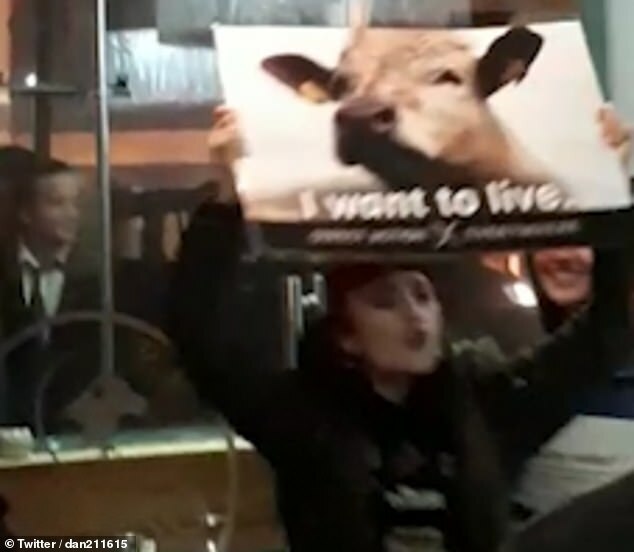 In November, members of the group who stormed a Brighton steakhouse, chanted 'it's not meat it's violence' and played sounds of cows being slaughtered were shouted down by a stag party who sang back at them 'stand up if you love meat'. The following month, a group protested holding shocking placards and forming a human chain around Christmas turkeys in Waitrose in Hove. But on Good Morning Britain Piers Morgan challenged three group members - Ashti, Ella and Dylan - who refused to answer whether their parents eat meat. When they finally admitted some of their parents are not vegan like them, the GMB presenter claimed they should be protesting against their parents - instead of 'terrorising old people in supermarkets'.